Air disasters inflicted on football, soccer teams, or sporting teams in general, do have their tragic role to play in sporting history. 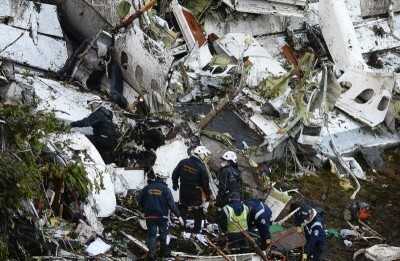 The devastatingly lethal destruction of the Brazilian soccer team Chapecoense on Tuesday in a chartered plane crash outside Medellín, Colombia, was far from the most notable, though it has been one of the more spectacular ones of late. In 1949, 22 members of the glorious Torino Club lost their lives in the crash of their Fiat airplane. The aircraft had ploughed into a mountain peak outside Turin, leaving supporters, and the country in general, in spiritual tatters. The demise of Il Grande Torino, led by the supremely gifted Valentino Mazzola, was even more shocking given their sheer dominance of the sport after spending time in the shadow of Internazionale, Juventus and Bologna. From 1945 to 1949, Torino won four consecutive Scudetti. Most of the side’s first team were also members of national side. For those caring to make the trek to the 300 year old Basilica of Superga, a marble plaque will greet them which, in translation, reads as: “Torino Football Club/ In memory of its comrades the glory of Italian sport and those who died with them in a tragic air disaster.” In the immediate aftermath of the disaster, the national team decided to avoid air travel altogether in travelling to Brazil for the 1950 World Cup, opting for the longer sea route. England, and more specifically Manchester, faced similar paroxysms of grief after the crash of a plane carrying the Manchester United team in 1958. Of the 44 people on the ill fated flight of February 6, 23 died, including eight players and, always the cruel collateral, eight journalists. Sprightly, dashing and youthful, the Busby Babes, a term coined after Sir Matt Busby, won league titles in 1956 and 1957. They were on their way from a quarter-final European Cup triumph against Red Star Belgrade on home soil. Among the dead were Duncan Edwards and Tommy Taylor. There are always gradations of grief. The fate of Chapecoense was made all the more acute given its own road of success, taking the high road in rather humble fashion to the Copa Sudamericana. Chalking up remarkable feats against such established names as Argentinean sides Independiente and San Lorenzo drew even greater interest in the country. Here was a side worth rooting for. The issue of whole teams vanishing in accidents is not unique to football. Professional ice hockey team Lokomotiv Yaroslavl was devastated in the crash of 2011, and still haunts that club’s history. Other team codes have suffered similar fates in the age of air travel. The shattering effect is compounded by the sense of total grief, the collective gathering of lives in one event. The fact that football is communal, with its rituals binding and lasting, makes the grief richer, and more shocking. In such loss, it is not merely blood that is shed. But these deaths will, in time, be assimilated into the folklore of Chapecoense. After such catastrophe, there are only a few responses short of the logistical point of rebuilding: to mythologise, to remember, and to wonder what might have been.